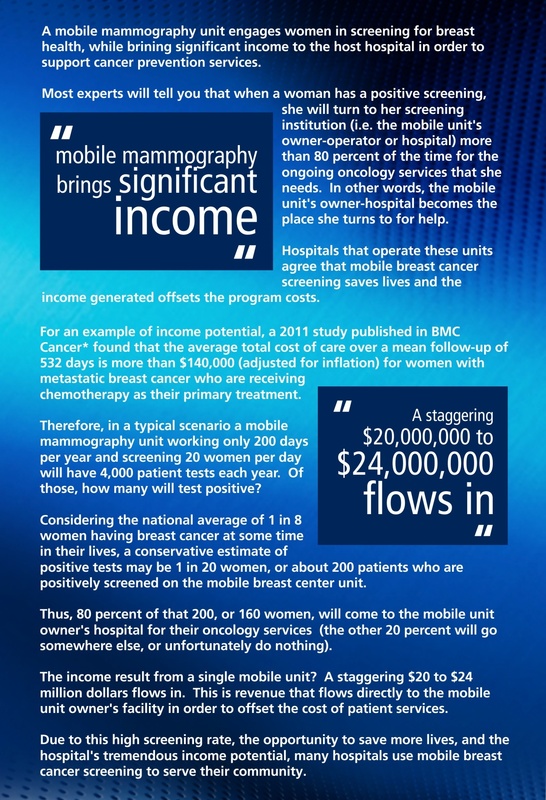 Mobile breast cancer screening units expand a healthcare systems’ market further into the community and increases billable screenings. It allows the owner-operator hospital to reach patients it may not otherwise be able to attract. By offering regularly scheduled screenings in both rural and urban areas they can better serve their community while establishing a new revenue stream. Studies show that even women in urban areas will be more likely to have a screening if access is made easier and more affordable. 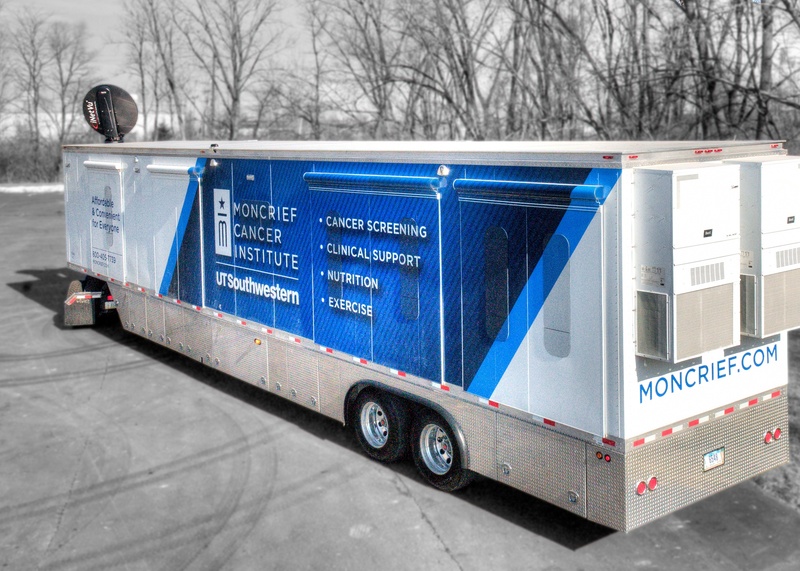 A mobile screening vehicle can be promoted and coordinated with employers through worksite intervention programs by offering a mobile mammography unit that comes to the workplace. Developing relationships with community organizations and employers helps protect the market by becoming a valued partner to constituents and employees. By working directly with their communities and leveraging existing community assets, mobile medical providers offer tailored, high-impact and affordable health care that responds dynamically to the community’s evolving needs. As they travel through the community these mobile health vehicles achieve tangible benefits to their organization with increased visibility, awareness and name recognition. An effectively branded mobile unit is essentially a traveling billboard for the healthcare provider. When a woman has a positive screening, she will turn to her screening institution (i.e. the mobile mammogram unit’s owner-operator or hospital) more than 80 percent of the time for the ongoing oncology services that she needs. A 2011 study published in BMC Cancer* found that the average total cost of care over a mean follow-up of 532 days is more than $140,000 (adjusted for inflation) for women with metastatic breast cancer who are receiving chemotherapy as their primary treatment. Considering that a mobile unit can have 4,000 patient tests each year and since 80 percent of those who test positive will seek their care from the same hospital the facility has opened a new source of patient referral. *Vera-Llonch, Montserrat, et al. “Healthcare Costs in Women with Metastatic Breast Cancer Receiving Chemotherapy as Their Principal Treatment Modality” BMC Cancer, BioMed Central, 15 June 2011, bmccancer.biomedcentral.com/articles/10.1186/1471-2407-11-250. (US dollars adjusted for inflation. Mobile mammography that is a part of an employer and or community partnership provides an opportunity to serve office buildings, factories, schools and community centers. With the proper marketing, serving these parts of the community provides alternative growth opportunities for the health system. When a hospital or other health system develops relationships with community organizations and employers they can secure the market by becoming an invaluable public service. And by being literally mobile the provider can control the schedule to optimize patient screenings throughout the month. Mobile mammography programs reduce many of the obstacles to breast cancer screenings faced by medically underserved women. The benefits of a mobile breast cancer screening program for patients, the community and the medical provider are significant. With the proper due diligence in establishing the market the service is highly profitable for health care providers and most importantly saves lives with early diagnoses. Furthermore, according to BMC Public Health breast and cervical cancer screening rates remain low among immigrant women and those of low socioeconomic status. The Cancer Awareness: Ready for Education and Screening (CARES) project ran a peer-led multi-lingual educational program between 2012 and 2014 to reach under and never-screened women in Central Toronto, where breast and cervical cancer screening rates remain low. The gendered barriers of balancing paid work, childcare and dependence on family members for transportation and language support still limit access for many women. Respondents across age and cultural groups explicitly expressed preference for the convenience and familiarity of nearby community-based screening and education sessions. Programs are often geared toward whole immigrant groups, and there are risks in attributing low uptake of service to cultural difference. The same strategic interventions may therefore be broadly effective across diverse groups of new immigrants. Community hubs, mobile health units, and employee or community-based ‘screening days’ were also suggested to address the time and financial burden of time off work and child-care costs.